One of our commercial projects was recently featured on HGTV.com! The article is full of design inspiration with a focus on bathroom vanities in nearly every design style and genre. The vanity from our FOUND Retail Boutique project was selected to illustrate Art Deco style. Art Deco is synonymous with glamour and opulence. The style has influenced buildings, architecture and design since the height of its popularity in the 1920s. What defines the style? Decadent details and bold symmetry, much like this vanity. The vanity also evokes an Art Deco style with its dramatic curves and bold contrasting finish. 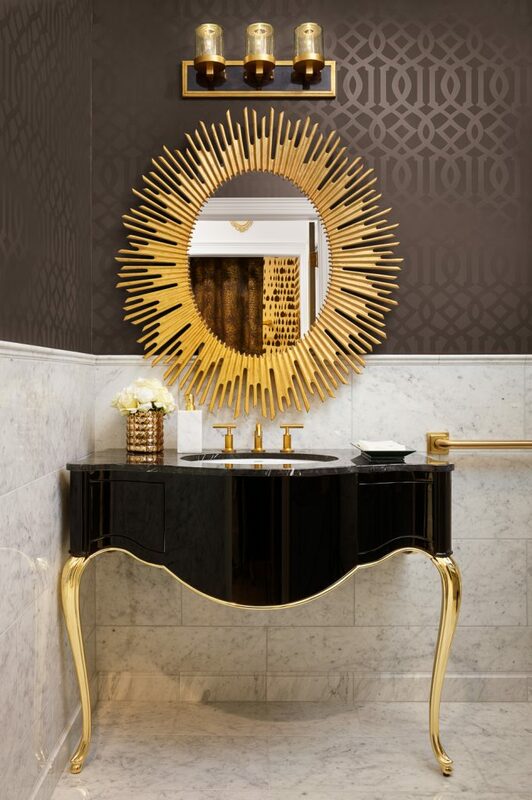 The glossy black vanity with glitzy gold details add some drama and grandeur to the powder bath. For this space, we wanted the vanity to look like a one-of a kind, custom furniture piece. We knew this vanity was integral to the overall bathroom design as it is the focal point of the room. It sets the mood for the glamorous aesthetic of the space. When selecting a vanity, select a piece that stays true to the style of your home and don’t be afraid to add in a piece that is both bold and interesting. Details like these truly will elevate your design. If you want help making your vanity a masterpiece, fill out our questionnaire and we will guide you through the process. In case you missed it, here is the link to the full HGTV.com article. It is full of fun ideas and inspiration! Thank you Ken for sharing!